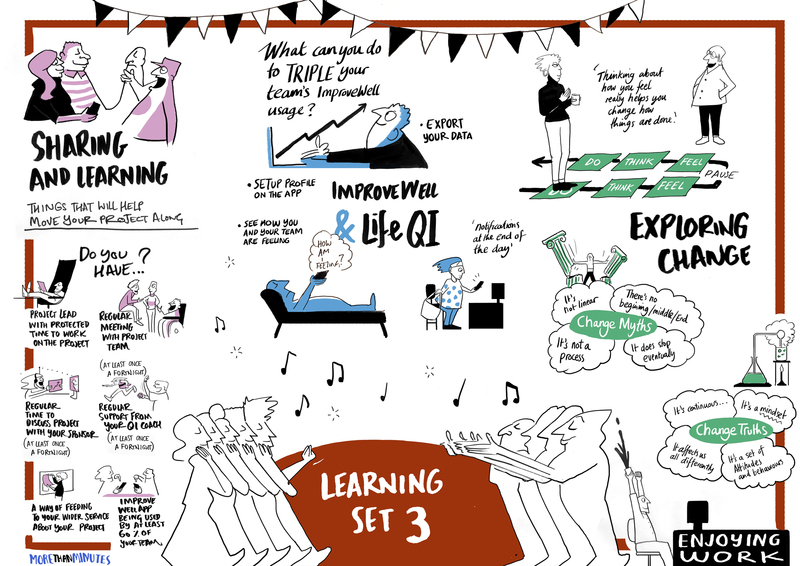 In June 2018, 21 clinical and non-clinical teams from across East London NHS Foundation Trust (ELFT) came together as the second cohort of the Enjoying Work learning system. Their goal was to enhance the experience of their staff at work, so that they can better serve our communities. This work was pioneered in 2017 with a prototype learning system containing 5 teams. 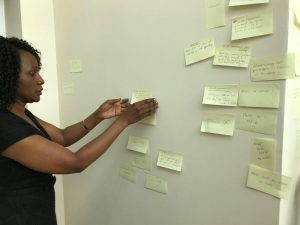 We use quality improvement learning systems as opportunities to bring together teams from across the organization for a period of time around a common subject. They then meet at regular events called learning sets which give teams opportunities to explore potential solutions and share experiences so as to accelerate their testing and learning around the topic. 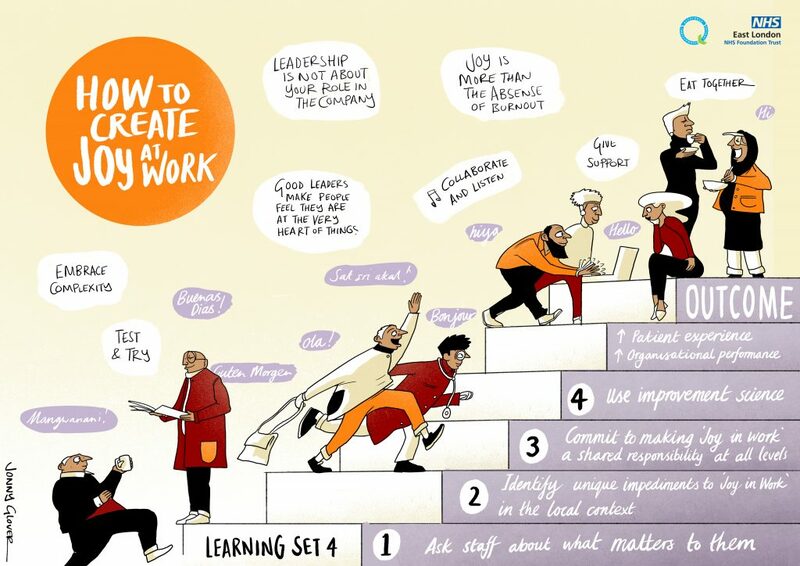 Through the two cohorts of the Enjoying Work learning system, individuals, leaders, teams and the organisation have continued to learn how to foster joyful places to work using quality improvement methods, leadership models, team building exercises and other tools and methods. 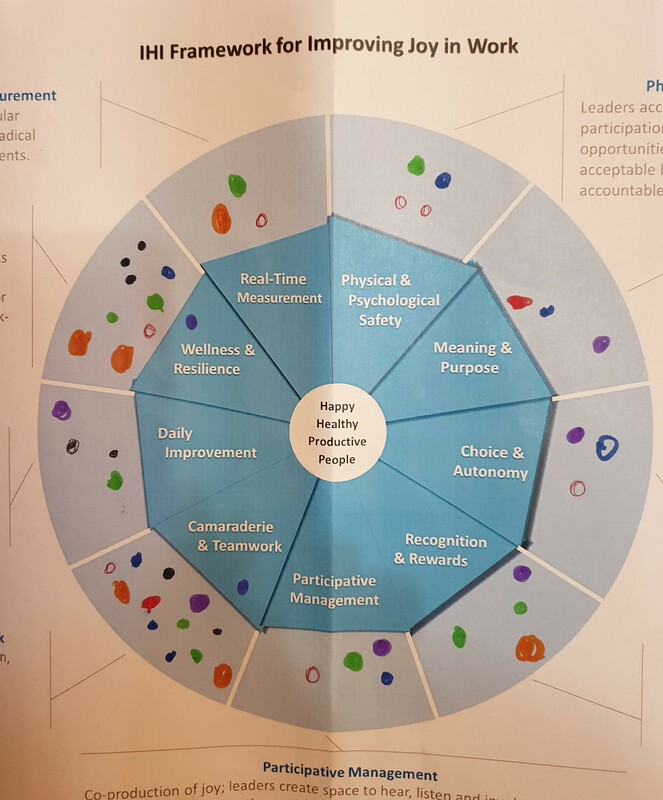 We have been testing, on a larger scale, what we have learnt about measurement of staff experience, leadership behaviours for change, how to engage teams, change ideas from the IHI Framework Improving Joy in Work​ and how to do quality improvement (QI) using the ELFT QI Method and the Model for Improvement. More than 500 staff in some 25 teams have already been involved in this work. Feel free to look through some of the stories from teams that have been doing this work. As you read through, look out for some of these themes (i) How teams come together to create their own solutions, (ii) How teams learn together and from each other, and (iii) How challenging, impactful, rewarding and fun the journey is. Behind the numbers are stories of teams and individuals who are making real progress towards creating great places to work. We hope this inspires you to explore different approaches to work in your own teams. Why not share your own top tips for enjoying work on Twitter with the hashtag #EnjoyingWork and tag us at @ELFT_QI. If you would like your ELFT team to join the next cohort that kicks off in summer 2019, Click here and follow the steps on this form to register your team. Registration is open until 14th June 2019. Follow how the work is progressing via this Twitter feed​. Hall LH, Johnson J, Watt I, Tsipa A, O’Connor DB. 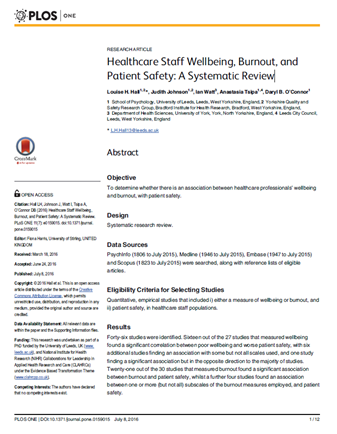 Healthcare Staff Wellbeing, Burnout, and Patient Safety: A Systematic Review. Harris F, ed. PLoS ONE. 2016;11(7):e0159015. doi:10.1371/journal.pone.0159015. 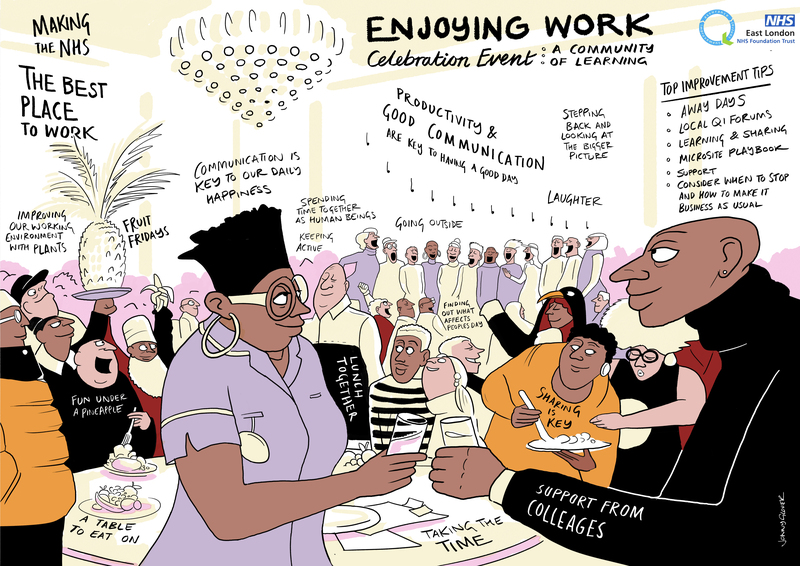 Thank you to everyone who attended the Enjoying Work Celebration event on on 1st February 2019. Well done for the amazing work teams have done over the last 8 months. Your teams’ stories were so inspiring. Keep up the good work!! Thank you to everyone who attended Learning Set 5 of Enjoying Work on 23rd November 2018. It was a fine opportunity to think about the stories behind your work. A photo gallery of the day! In the sections below you can also access further information from the learning set and also what teams should be focusing on in the lead up to our next learning set in November. Have a look at the slides that Derek Feeley used when sharing the IHI Framework for Joy in Work. 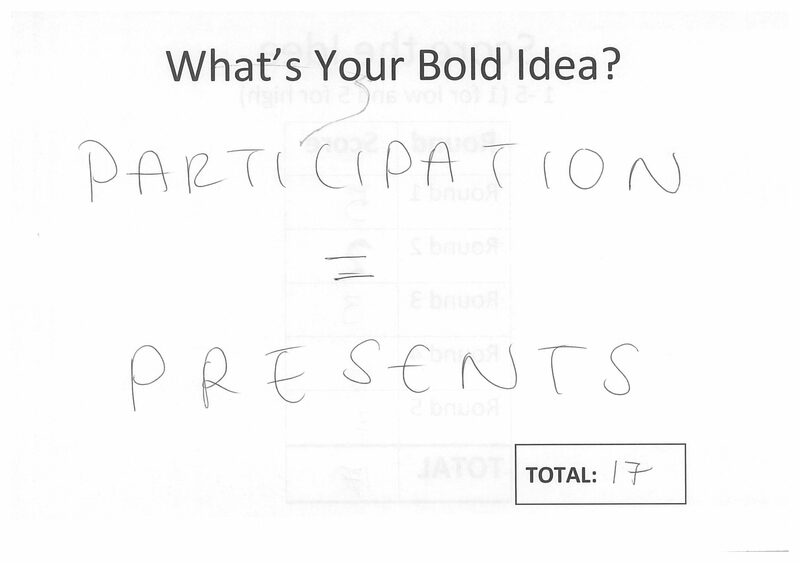 Look out for slide 10 which shows the critical components for ensuring a joyful, engaged workforce. 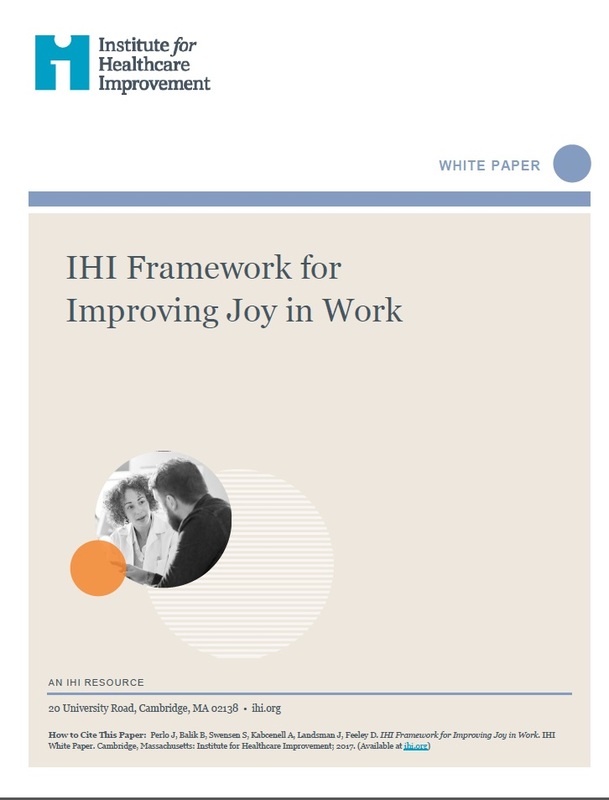 IHI Framework for Improving Joy at Work. Each coloured dot on this image represents a test of change made by a team. Have a look at the slides that Derek Feeley used when sharing the IHI High-Impact Leadership Framework. Why not compare yourself against the behaviours of traditional and collaborative leaders on slide 15. Here’s what you need to do in the action period between now and the next learning set. Collaborate with another team in the learning system that has solved a problem you are grappling with. We hope you were encouraged by our learning session on 28th June to aid you along your journey towards helping your team enjoy their work. We have attached a PowerPoint presentation with everything you need to do this including some pointers in the notes section. This is also provided as a PDF handout so you can print out and refer to during the exercise. Your QI Coach can help you facilitate this. Collect the Good Day Measure for at least 4 weeks before the next learning set. Continue to collect thereafter. 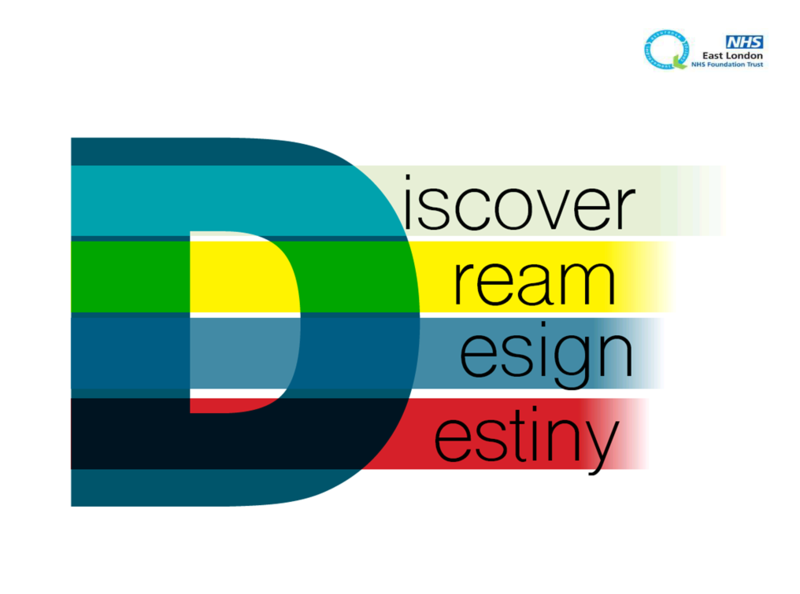 Inform the QI team who your project lead, Data Champion and Team/Service leader is. They will be able be given permissions and instructions to set the time of daily notifications, set bespoke surveys and download team data and responses. Discuss with your team and assure them this will help them identify things that work well and areas for improvement and that their responses to the Good Day Measure are anonymous. Get everyone to download the ImproveWell app on their personal or work phone or tablet (Android or iOS) from their app store or through https://www.improvewell.com/. Download and sign-up instructions attached. A unique team code for your team will be sent in a follow-up email today. 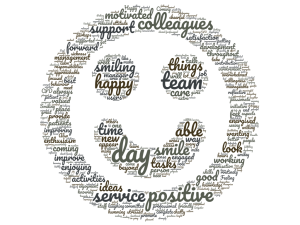 For the first few weeks, have a process for encouraging people to complete the Good Day Measure. Create brief regular 10 minute slots (weekly if possible) to look at the data and group the ‘Mostly Yes’ and ‘Mostly No’ responses into themes by printing the responses and using Affinity Diagram exercise to group them. This will be sent by the QI Team through the ImproveWell app as a survey on 16th July. People will get a notification on their phones when it the survey goes live. The survey will be open until 31st July. Your Data Champion and Team/Service Lead will be able to access the results and share with the team. Once identified to the QI Team, they will be sent further information and support to use enhanced features of the ImproveWell platform. Discuss with your team and assure them this will help them identify things that work well and areas for improvement and that their responses to the Pulse Survey are anonymous. Come up with a process for encouraging people to complete the Pulse Survey. Arrange a time for the Project Team to look at the responses together and how to share with the rest of the team. To help identify you project, please start the title of the project with “Enjoying Work –“ Your QI coach can help you with this. 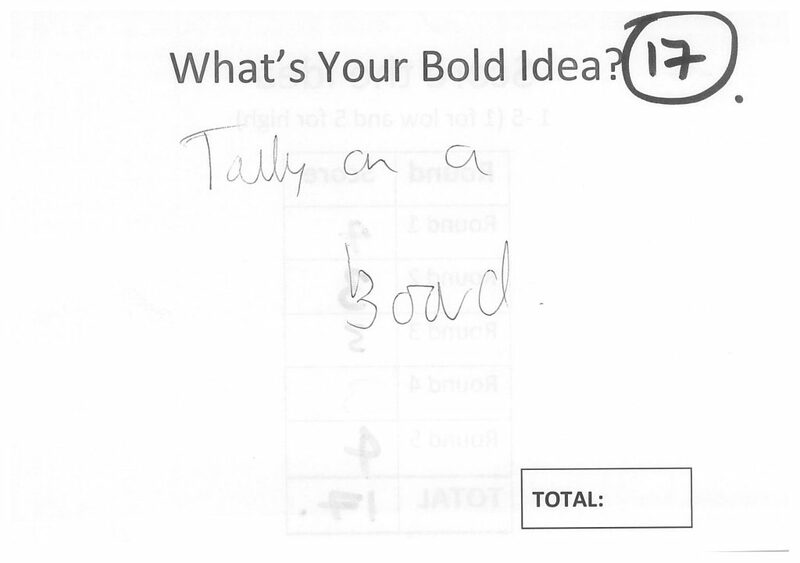 Use all the above to come up with or refine the aim of your project. Record on Life QI. Use your QI coach to help with this too. 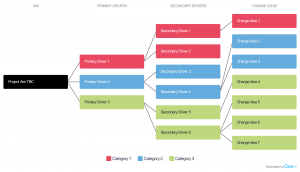 Use all the above to develop a Driver Diagram for your project. Use your QI coach to help and record on Life QI. As a project team, use the Readiness Radar to do a self-assessment of the conditions for giving you the best chance of success. Where you score low, come up with some ideas of how to improve. Access the Readiness Radar tool here>> Please ask your QI Coach or QI Sponsor to help with this. Please arrange for 1-3 people from your team to attend the next learning set. Travel Expenses: Travel expenses will be reimbursed using the standard Expenses Claim from using the QI Team Budget. If your service already uses the online trips platform for train tickets, drop us an email and we will give you the budget code to use. We look forward to seeing you in August in Luton, hearing you share your stories from the constructive discussions you are going to have with your teams and working together to get to testing some of their ideas. We will put together the ‘must-dos’ we developed today and share them at the next learning set. Visual summary of topics covered in the Enjoying Work Learning set 3. Illustration by Jonny Glover (More than Minutes). 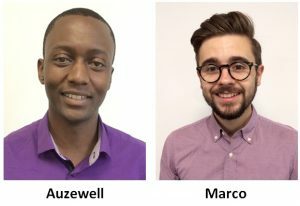 Find out why the City and Hackney Rehabilitation team and the Business Development team have made the decision to focus on improving enjoyment at work and what their experiences have been so far. Also as part of the QI project, the team are doing something they call ‘Networking with BDU’. 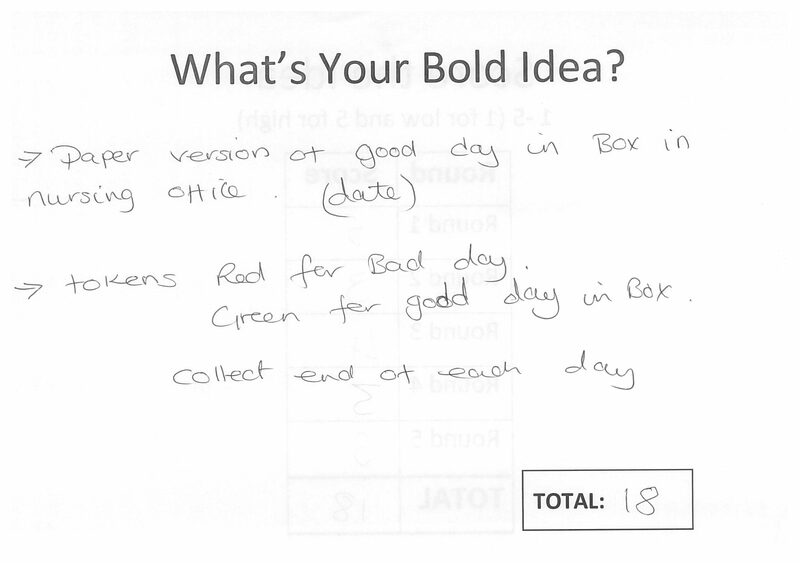 One of the change ideas was how to make work meaningful and improve psychological well-being. “In order to have good working relationships with others and build recognition, we need to be more ‘out there’”, Lulu says. “Each month we will pop dept names in a hat, starting with Corporate services and invite teams to join us for a social. No requests for work, no talking business, just get to know each other. We have already invited Finance and we are doing a Doodle poll to select best dates for lunch”. 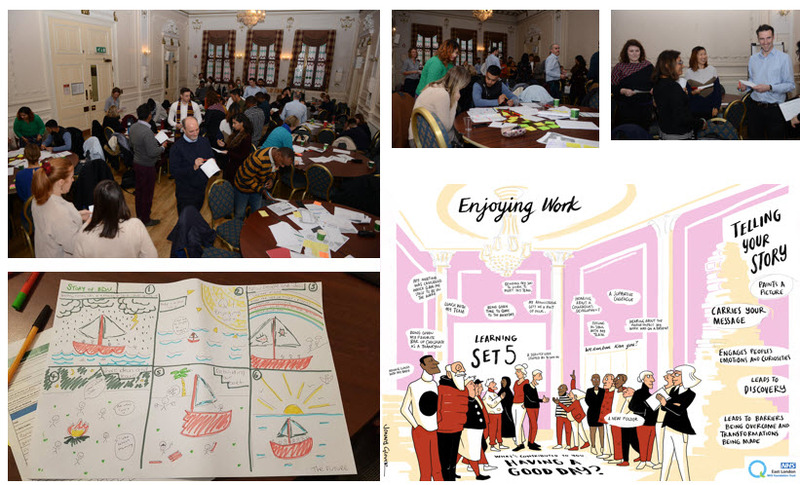 What inspired you to join the Enjoying Work Learning Set? What does this work mean to you and what will it help the team improve? The team came together at our Away Day in April 2018 and we talked about the opportunity of possibly getting involved in the project. 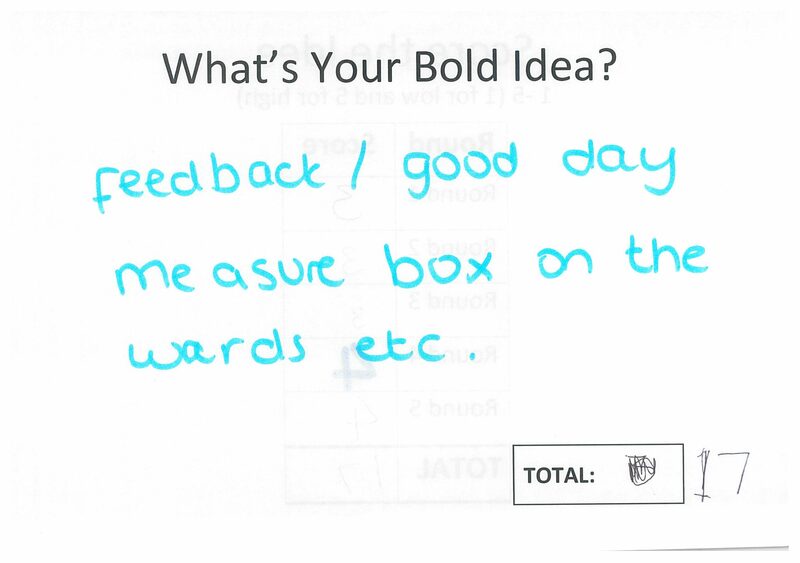 Staff readily identified many positive aspects of working in the Rehab team, however we are always seeking to improve. We acknowledge that the work we do with service-users can be both rewarding and yet frequently challenging. The team has taken on many new roles and is required to tolerate changes and to constantly adapt. We know this can be also quite difficult at times and wanted to ensure we were giving enough thought to the well-being of staff and the health of the team. Who is taking part of the project and how are you involving the broader team as part of the changes? What change ideas have you tested? 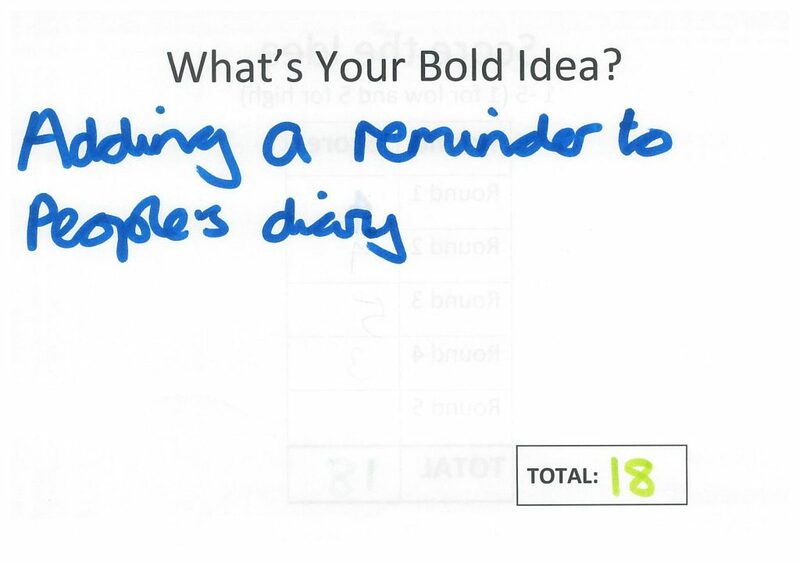 We had a team session recently where many ideas were generated. Many of these were around staff wellbeing, such as from having a yoga class here at Primrose Square, or having plants in the office to create a healthier environment and a picnic table for the garden so that staff can have an outdoor space for lunch breaks. Other ideas were around organisational issues, such as changing times of meetings, who should be attending and looking at how we use our OT resources in the community. Others were more around generating a positive social environment, possibly introducing a team bake-off, or having more social gatherings after work. Have you found anything challenging and how are you working together to overcome them? 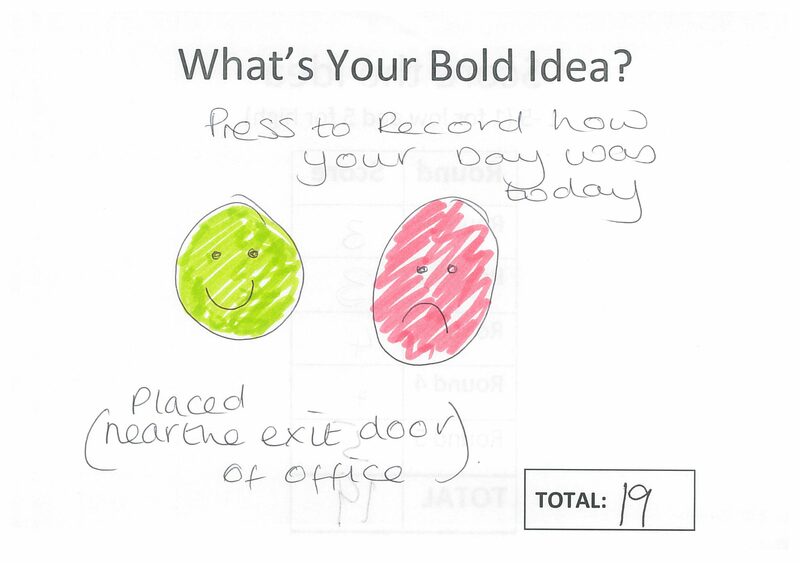 To see if the changes we are making are making things better, we are using Improvewell (a phone app) to ask whether or not people have had a good day. Response rates on ImproveWell are reasonable but could be better. Finding time to get together as a core group is also at times challenging, due to different schedules. Keeping the momentum going, and motivation is also a challenge, however the team lunches do seem to be helpful in having time for all to put our heads together and work on improvement. 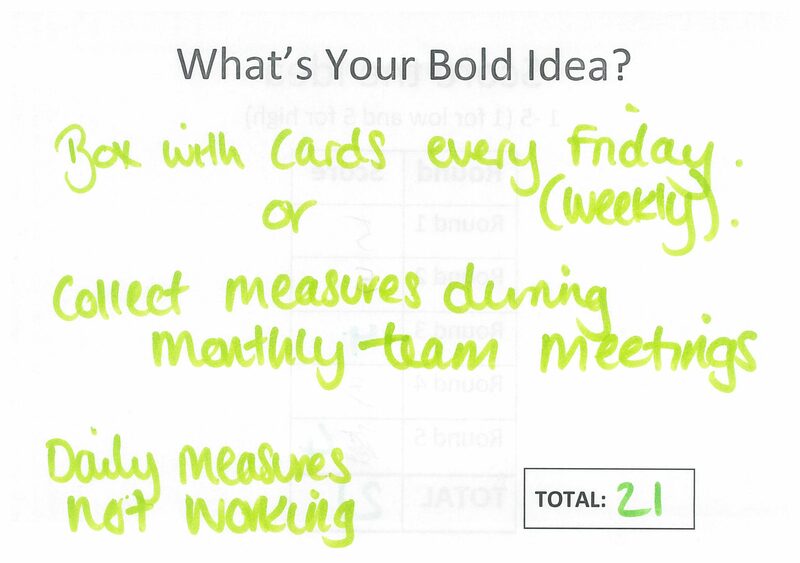 Understanding how to input data has been a bit of a challenge too, however the QI team have been very supportive. In the long term, how do you see this evolve? Where do you want to be as a team? We would like to use the project as a means to think creatively about some of the difficulties we face and how to find ways around them. 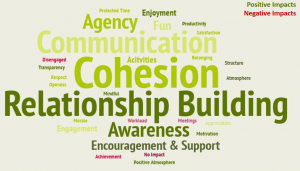 We are all so busy day-to-day, we hope the project will give us the headspace and the structure to reflect on how we are individually and as a team, and how we can prioritise our health and well-being, so that we can continue to work effectively with service users. The Enjoying Work team is formed by Rosalind King and Patricia Simoes (project leads), Hester Morgan, Irene Kulubya and Elaine Athanas. To make it easier for you to refer back to the content, resources and actions from the learning set, we have put everything on this webpage. Feel free to share this information with the rest of your team. 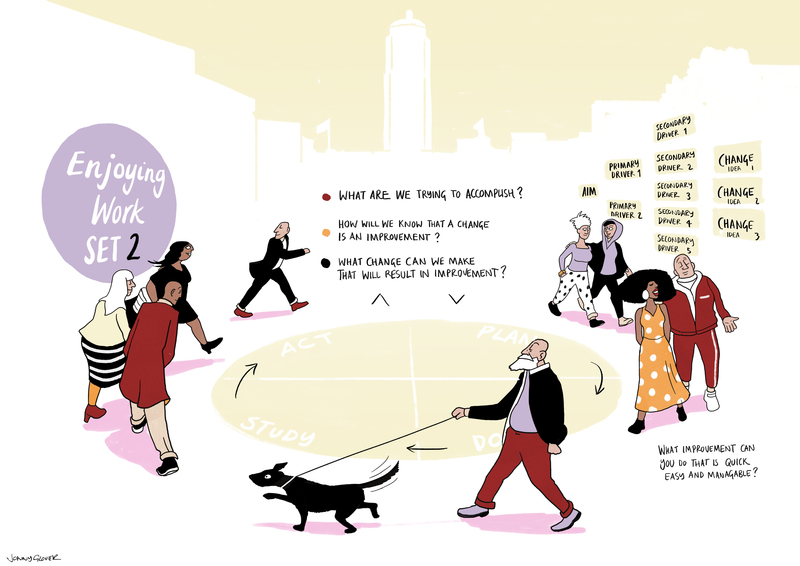 Have a look at these summary slides for a closer look at the project presentation by Marisa Bouman and Kulwinder Sanghera from Isle of Dogs CMHT in Tower Hamlets and slides of how to get from ideas to testing including examples from other teams and organisations. Here is a short clip of the body percussion activity we did with Imogen Dyer from the Arts Therapies Department and Rhia Parker from the Guildhall School of Music & Drama. 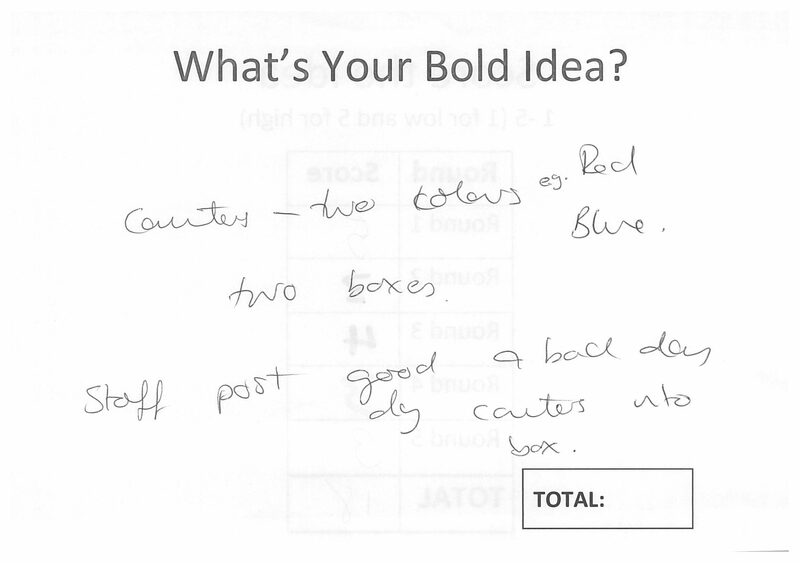 Plan to test at least 2 change ideas between now and the next learning set. 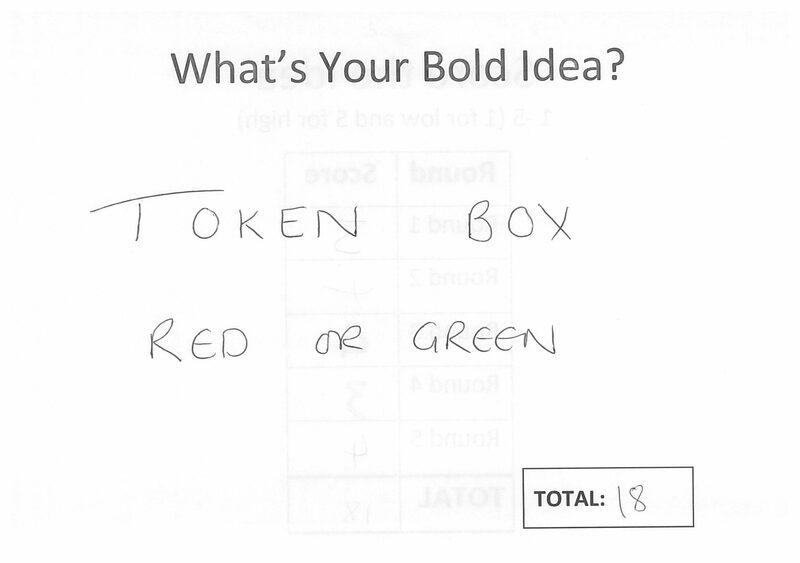 Come prepared to share your driver diagram, PDSA or Kanban/similar tool. At the September Learning set we will be looking at leadership in change and improvement. So please arrange for up to three people from your team to attend including team manager/service lead. ELFT staff, service users and carers can access full details of this project on Life QI .The project code is 103865 please log onto your Life QI account before clicking the logo below. Please click on the image to view the Appreciative Inquiry PDF. The IHI are our strategic partners in this Quality Improvement journey. 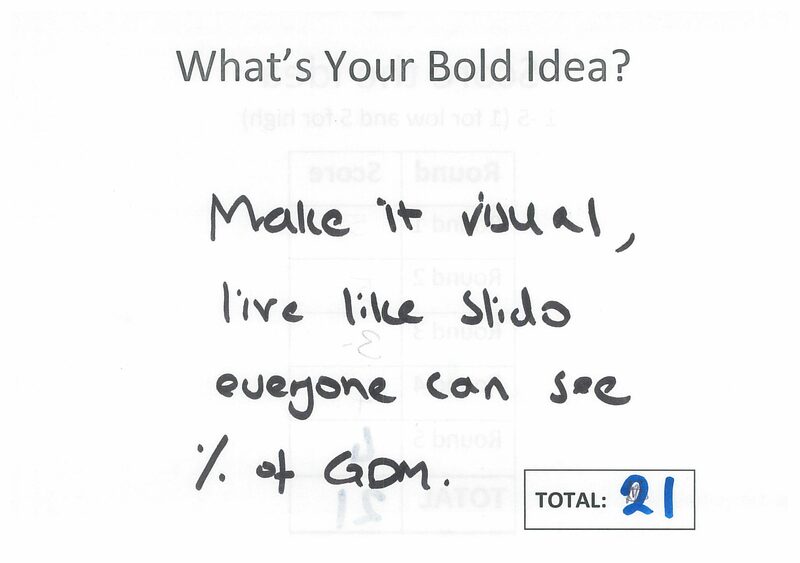 Please click on the image to read their Change Ideas document. Please click on the image to open the paper. 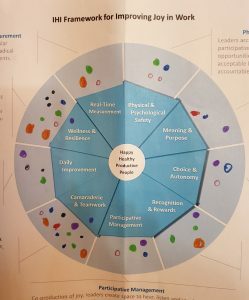 In previous newsletters, we shared some of the Trust-wide priority areas that are being tackled collaboratively by several teams using QI (Quality Improvement) as the design framework. One such work-stream is “Enjoying Work”. Feedback from staff through different avenues, including the annual staff survey, has highlighted the need to improve the experience of staff working across the East London NHS Foundation Trust (ELFT). A handful of teams started to work at addressing the issue of staff satisfaction and morale by running improvement projects. 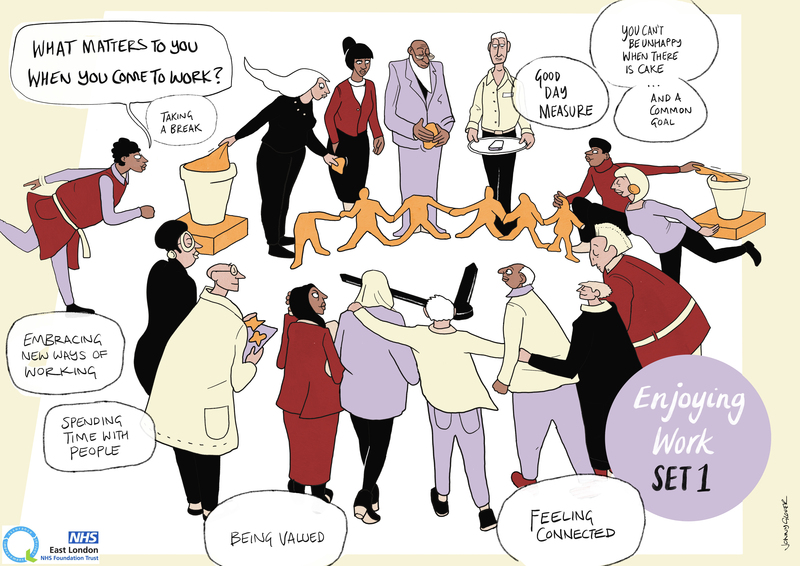 There is a wave of interest internationally in bringing back joy in work1. 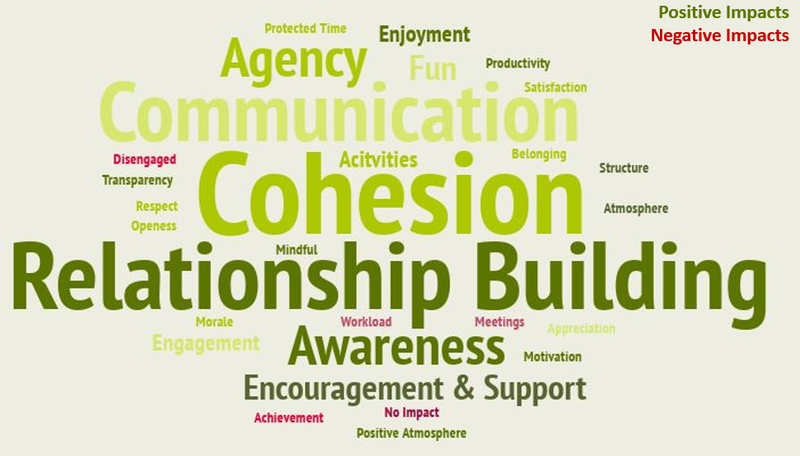 In addition to running appreciative enquiries with some teams, a survey was sent to all staff in early 2017 to gauge what matters to them. What came out of that exercise was astonishing. There was a lot of emphasis on needing to rebuild meaning, teamwork, trust and embrace new ways of working. The responses received from eighty-five survey responders and three services were used to create the wordcloud that is now the symbol of this work. Each service has established a project team which consists of staff from that service. They also have a local sponsor from the directorate management team, a Quality Improvement Advisor to coach them and a named Business Partner from the Human Resources/Organisation Development team. Mason Fitzgerald, Director of Corporate Affairs, is the executive sponsor for the workstream from the Trust Board. This work will also be linked to other work taking place across the organisation on leadership development and compassionate leadership. We are also keeping in contact with other organisations that are doing this type of work to collaborate and learn from each other. 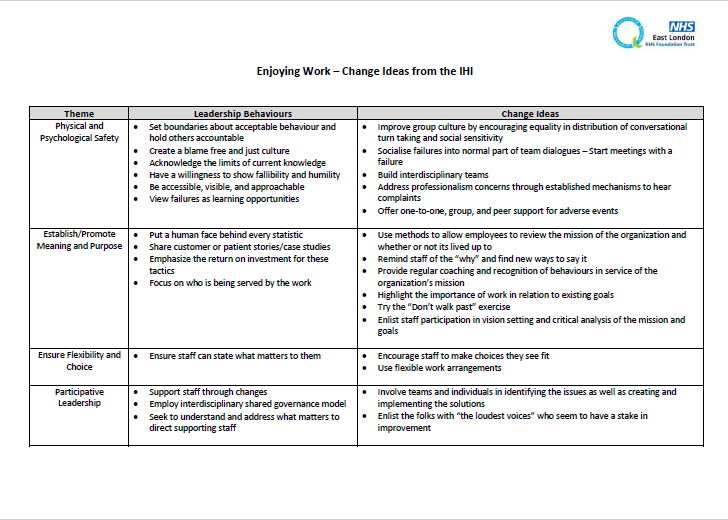 We have also adopted the change ideas and change concepts identified by the IHI (Institute for Healthcare Improvement) in their recently published framework for improving joy in work in healthcare organisations2. Some of these will be tested by the prototype teams together with their locally generated change ideas. In the preliminary stages of the work, the prototype teams have been testing how best to approach this work in terms of measurement, appreciative enquiry, defining the problem and testing change ideas. 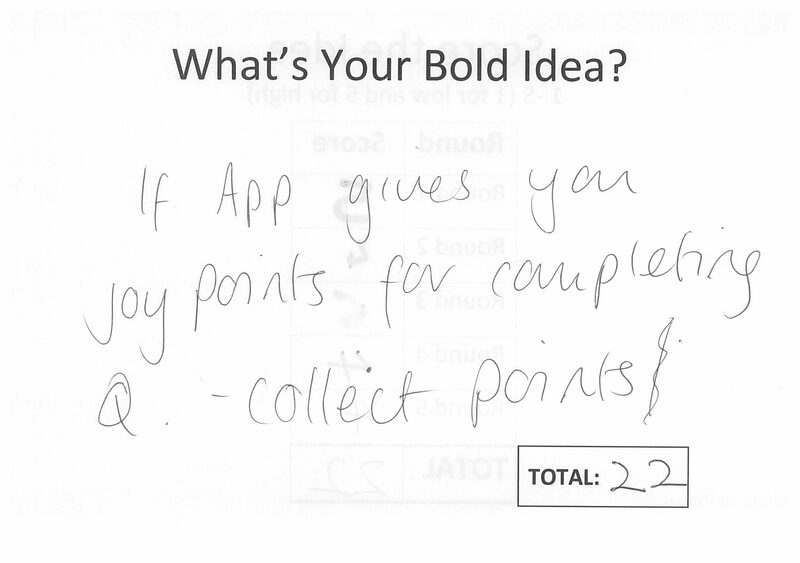 Some of the prototype teams are still collecting baseline data which will help us set a global aim for this work. We expect that the learning that comes from the teams doing this work will be scaled up to the rest of the organisation as we build confidence in the approaches and changes being tested. Colleagues from Human Resources and Organisation Development will also be working closely with these prototype teams to test out the new Business Partner model of supporting teams and leaders in tackling specific challenges when leading and delivering services. You can also read in this newsletter about the events that took place in September with more than 200 staff, with Professor Steve Swensen who has led much of the research and work internationally on understanding staff burnout, team engagement, joy in work and quality improvement. After the publication of the annual staff survey, many teams make an action plan to address some of the issues which come to light. This also tends to happen throughout the year following team away days and other occasions. 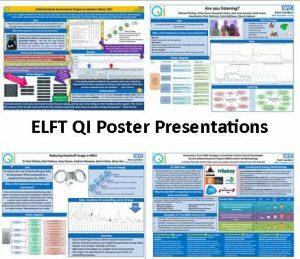 At ELFT, improvement has always been part of our DNA and we know that most problems can, and are, being solved without necessarily starting a formal QI project. We would love to hear about what you have tried in your team and what you have learnt while trying to improve staff enjoyment of work. 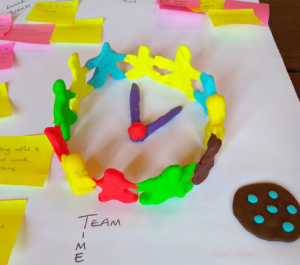 In addition, if you would like to test out some of the tools that the prototype teams have developed for carrying out an appreciative enquiry, or the simple measurement tools, please get in touch. Drop us an email at elft.qi@nhs.net with the subject line “Enjoying Work”. 1Feeley D, Swensen SJ. 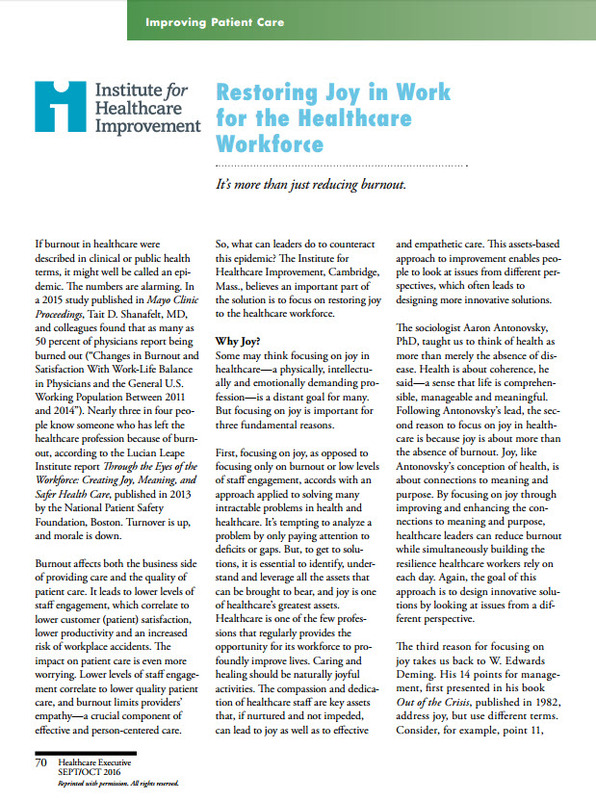 Restoring joy in work for the healthcare workforce. Healthcare Executive. 2016 Sept;31(5):70-71. 2Perlo J, Balik B, Swensen S, Kabcenell A, Landsman J, Feeley D. IHI Framework for Improving Joy in Work. IHI White Paper. Cambridge, Massachusetts: Institute for Healthcare Improvement; 2017. The 2016 NHS Staff Survey showed us that we have made significant progress as an organisation in terms of staff engagement. We are committed to making further progress in the areas we have improved in, such as recognition and value of staff by managers and the organisation. Additionally, we want to address the areas that our staff identified as needing further improvement. 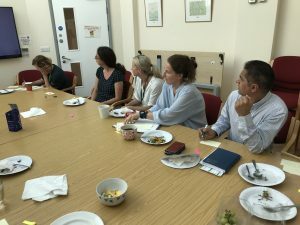 One of the actions taken was to invite Professor Steve Swensen to run workshops with leaders from all levels of the organisation to help us building on our culture of caring for our patients and each other. Steve Swensen has led much of the research and work internationally on understanding staff burnout, team engagement, joy in work and quality improvement. He previously led on leadership and organization development at the Mayo Clinic, a large healthcare system in America with many similarities to ELFT. He is currently Medical Director for Professionalism and Peer support at Intermountain Healthcare. Steve ran several masterclass sessions with the executive team and leaders from around the Trust on 14th and 15th September 2017. Over the course of two days Steve helped us think through how we can support leaders to create an environment that prevents staff burnout, empowers everyone to be part of the solution by embedding a model he called “esprit de corps” – taking care of each other for the benefit of our patients. Over 200 members of staff from a range of professional backgrounds attended a variety of workshops and events to learn about building “esprit de corps”. 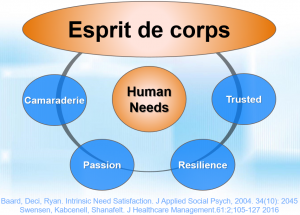 The model encourages leaders to address four basic elements – trust, resilience, passion and camaraderie1, 2. Develop resilience in staff – Encourage staff to take care of their own health and wellbeing. Of course, that sort of change doesn’t happen overnight and Steve’s key take away point is to start an open and honest dialogue with staff by asking what matters to them, what gets in the way and work together to design solutions to problems. 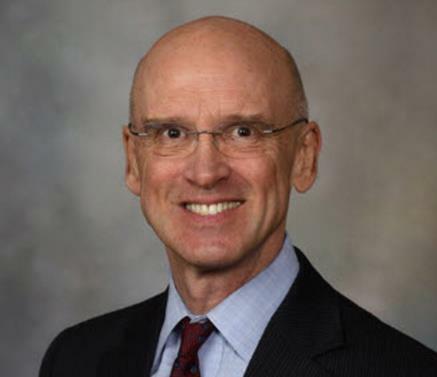 2Swensen, S., A. Kabcenell, and T. Shanafelt, Physician-Organization Collaboration Reduces Physician Burnout and Promotes Engagement: The Mayo Clinic Experience. 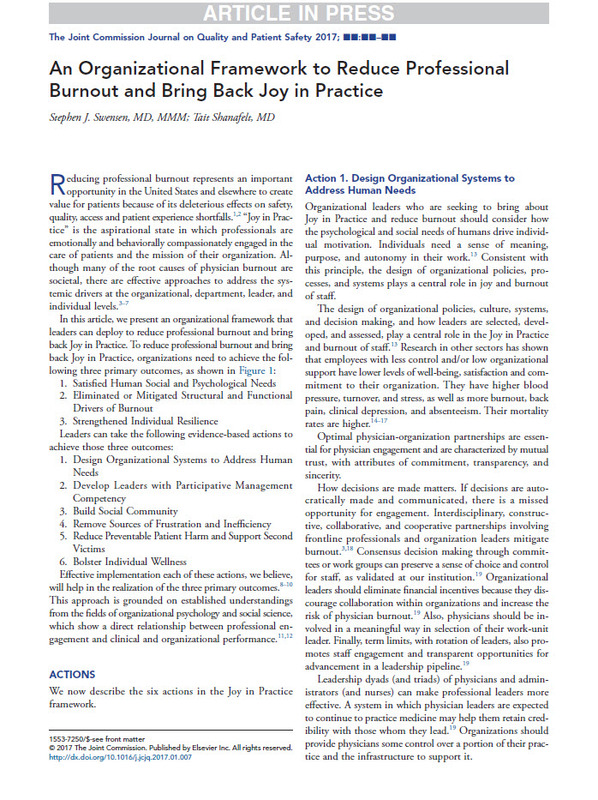 Journal of healthcare management / American College of Healthcare Executives, 2016. 61(2): p. 105-127. During the two day visit he will meet with close to 200 ELFT staff, service users and carers who are working together on these issues. We will share some of the outcomes from these learning groups and workshops with you over the coming weeks. 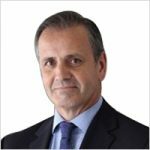 Watch Steve present alongside Derek Feeley, CEO & President IHI, and Jessica Perlo IHI, at the 2017 International Forum on Quality & Safety in Healthcare. The epidemic of physician burnout undermines quality of care, patient satisfaction, and access to care, making it a major threat to the US health care delivery system. Burnout is primarily a system issue—not a problem of individual resilience. 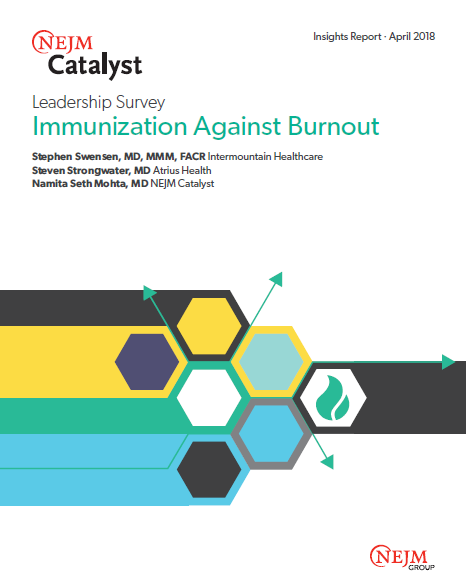 Accordingly, meaningful progress will not be made until the drivers of burnout are addressed at the level of the organization and care delivery system. Click on the image to read this paper. While burnout in the health professions is alarmingly high, restoring joy in work is more than just reducing burnout. So, what can leaders do to counteract this epidemic? This article describes four key steps that leaders can take to restore, foster, and nurture joy in the health care workforce. Feeley D, Swensen SJ. Restoring joy in work for the healthcare workforce. Healthcare Executive. 2016 Sept;31(5):70-71.